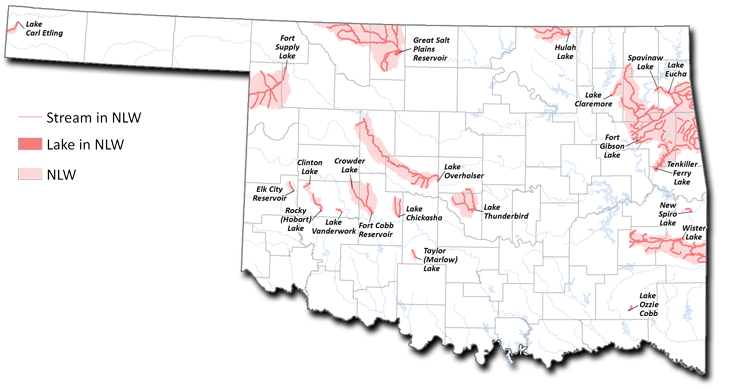 Protecting and preserving the water quality of Oklahoma’s lakes is essential. The health and welfare of Oklahoma citizens, as well as the economic prosperity of the state, are tied directly into having surface water supplies that are reliable and of good quality. Oklahoma lakes provide water supply for millions of Oklahomans and generate millions of dollars every year for the state’s economy in many ways including tourism and recreation. Thousands of species of aquatic plants and wildlife are dependent upon the state’s lakes for habitat and propagation. Through assignment of as many Beneficial Uses as are attainable, the OWQS ensure that existing water quality is not unduly impacted. Science-based narrative and numerical criteria are imposed in the OWQS so that Beneficial Uses can be attained and pollution or waste of state waters will be limited. Physical, chemical, and biological data on Oklahoma’s lakes are obtained and analyzed by the OWRB’s Beneficial Use Monitoring Program (BUMP). BUMP data plays an essential role in the identification of waters experiencing impairments as well as the cause of declining water quality. 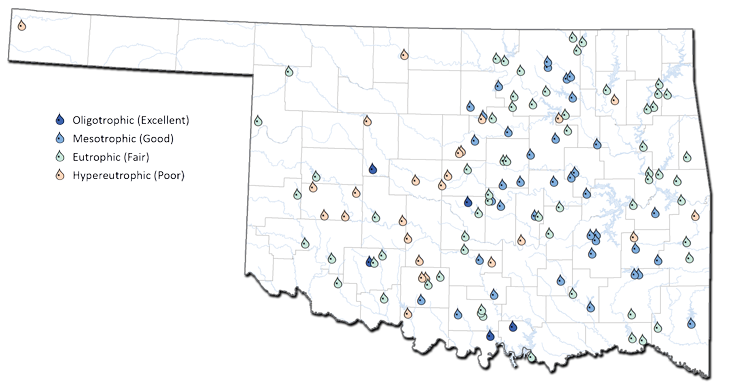 Data collected for Oklahoma’s lakes through BUMP sampling and analysis are available here. 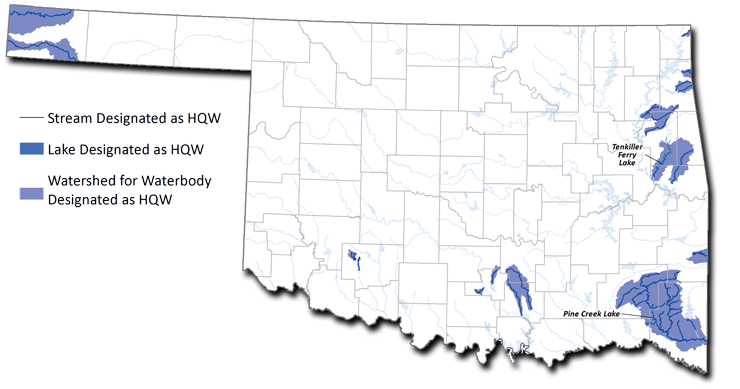 The Oklahoma Water Quality Standards (OWQS) provide protection for Oklahoma water by establishing water quality benchmarks and serving as the basis for development of water quality­–based pollution control programs, including discharge permits, which dictate specific treatment levels required of municipal and industrial wastewater dischargers. 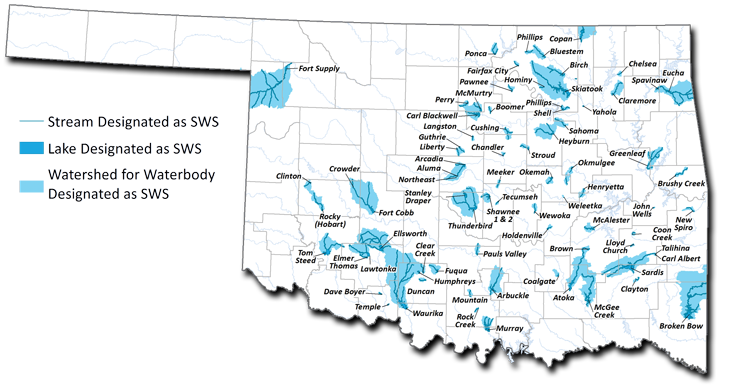 Much of the state’s surface water is given additional protection through special designations, including High Quality Water (HQW), Nutrient Limited Watershed (NLW), and Sensitive Water Supply (SWS). For more information visit the OWQS page. The HQW designation refers to waters that exhibit water quality exceeding levels necessary to support the propagation of fishes, shellfishes, wildlife, and recreation in and on the water. This designation prohibits any new point source discharges (such as municipal and industrial wastewater) or additional load or increased concentration of specified pollutants. The NLW designation refers to a watershed of a waterbody with a designated beneficial use that is adversely affected by excess nutrients as determined by a Carlson’s Trophic State Index (using chlorophyll-a) of 62 or greater. Excess nutrients, usually nitrogen or phosphorus, stimulate algal growth. The SWS designation applies to public and private water supplies possessing conditions that require additional protection because they are more susceptible to pollution events. This designation restricts point source discharges in the watershed and institutes a 10 µg/L (micrograms per liter) chlorophyll-a criterion to protect against taste and odor problems and reduce water treatment costs. The latest data indicate that about 19% of BUMP lakes are classified as hypereutrophic, which means they contain excessive amounts of nutrients. In improving order of quality, about 48% of lakes sampled are considered eutrophic, 29% are mesotrophic, and 4% are oligotrophic (waters relatively low in nutrients). Lakes classified as oligotrophic include American Horse, Carter, Elmer Thomas, Murray, and Stanley Draper. A lake’s trophic state, essentially a measure of its biological productivity, is a major determinant of water quality. Excessive levels of nutrients can lead to low dissolved oxygen and algal growth, which can cause taste and odor problems.